Major historical events lend themselves to fictional narratives precisely because massive population displacements caused by war or other disasters open up spaces in which to experiment...But fiction does not fill the gaps in the historical record, good historiography does. Elementaryhistoryteacher at the American Presidents blog writes The Ostend Manifesto to raise the question, what would have happened if Spain had sold Cuba to the US in 1854? At the Vapour Trail, Melissa Bellanta remembers This Holocaust of Ballet Girls: the tragic combination of hot stage lighting and gauzy dancing costumes meant that audiences in the 1840s might witness loveliness --or a terrible death-- from their theatre seats. Tim Abbott's Where was John Polhemus... at Walking the Berkshires is part of an extensive series investigating the Court Martial of a Colonel of the New Jersey Line in 1779. In this episode, the factual assertions of a Revolutionary War veteran's memoirs are tested against other records, and found to be exaggerated at best. ...one of those 1,000-piece monsters, perhaps a detailed old-master landscape, but the cat has been comprehensively sick on the lid of the box and, inside, there are only about 50 random pieces, some of them just bits of sea or sky. One or two of the pieces may possibly fit together, but there is an awful lot of space to fill-in in between. Meanwhile, Joachim Neander responds to a Holocaust denier about a specific event in 1941, at Holocaust Controversies, with hard details. The Bloom of Ninon was marketed as a lovely cosmetic preparation--but as Caroline Rance notes, an emulsion of white lead wasn't safe to spread on anyone's skin. Lauren Hewes at Past is Present observed a February holiday with a collection of Hairy Valentines (shudder). A man swapping eyes with a falcon? Welcome to medieval Iceland. Continuing the animal-human theme, Strange Maps has a map (imagine that) of the Secret Caves of the Lizard People -- under 1930s Los Angeles, of course. The Wellcome Library has graphs and posters related to the Swiss temperance movement of the early 20th century, including one tracing a close relationship between the price of schnapps and admissions of alcoholics to lunatic asylums. And a pink bathroom for your son? Nothing remarkable about that, in a 1954 plumbing ad at Retro Renovation. The London School of Economics Archives blog, Out of the Box, announces a new online resource called "Round About a Pound a Week," which digitizes the household budgets of working-class women in 1909-1913 Lambeth. The gold medal for best snow-related history blog post title in February 2010 goes to M, for "Did Alexander the Great Fight a Yeti?" Being the World History Blog, I'm not sure which anthem to play for you, so maybe this is a good place for the closing ceremonies to begin. 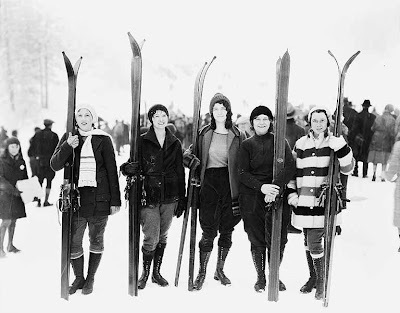 To cap off the carnival for this edition, the Library of Congress blog Inside Adams has a nice collection of links to their online resources on the history of winter sports. Hosting the History Blog Carnival is fun--so fun that this is my third time around the track. Join the team! Sharon Howard is always looking for volunteers. Many thanks,Penny. Loved the post about the hairy valentine in particular! Also the comment you left on it: was finging the braid really sensory overload? ... Oops, I meant 'finding the braid'. That's what comes of typing while trying to nod appreciatively to a primary-schoolers' violin demonstration. The hair wasn't braided--it was just long ponytail all puddled together. Maybe that did it. I don't know. I only know I didn't want to look at it long. Thanks Penny - love the photo! i have a photo of my grandma skating during a winter olympic! too bad she did not won but still she was there and it counts! Disability Blog Carnival #64 is up NOW!